CASEY DESIGN | PLANNING GROUP INC. Client's family room with flush mounted TV above fireplace. 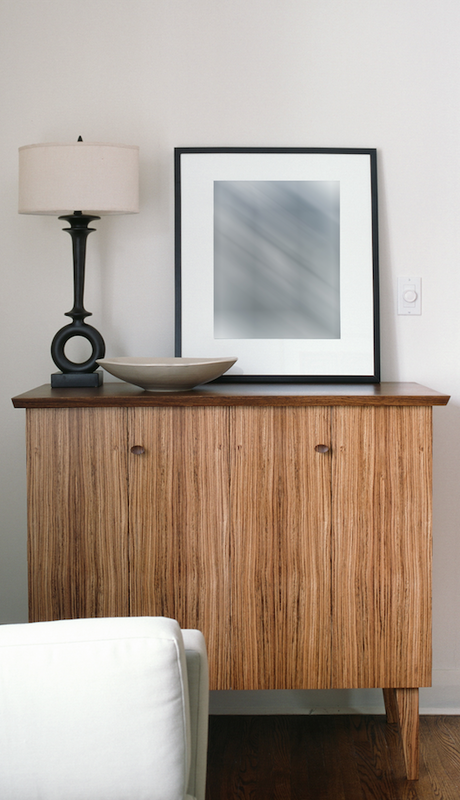 I designed this zebra wood custom cabinet over 10 years ago and I still love it. On the right, see the inside guts that previousy housed stereo and CD's. 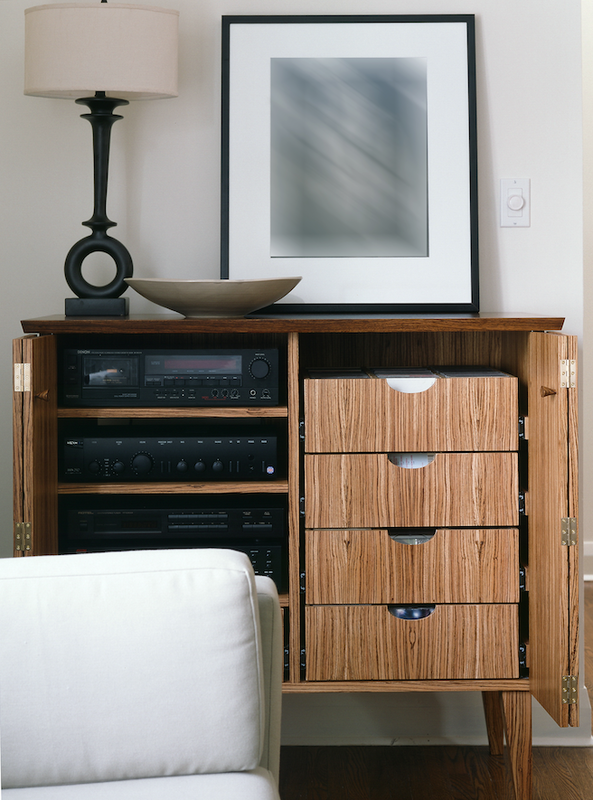 But, my client has re-gained this storage since we have outfitted their home with wireless systems. Concept sketches for home audio visual needs in these clean built-in units. 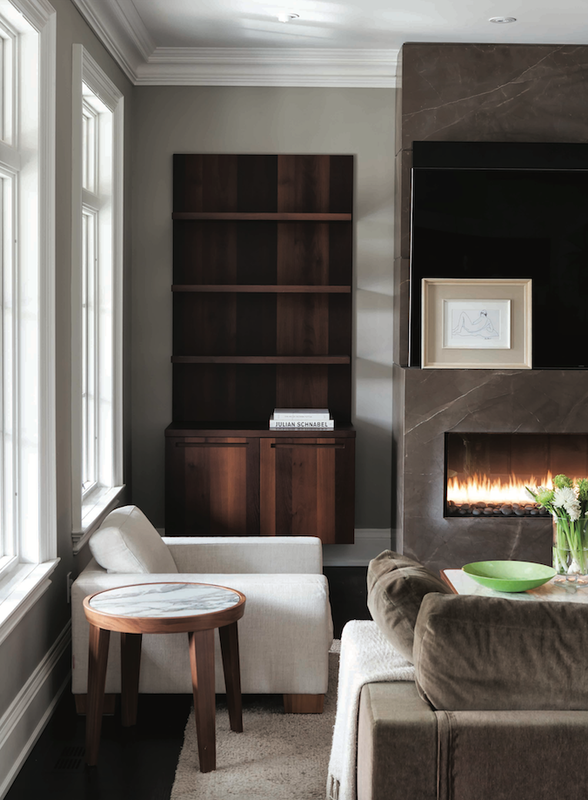 See all the hidden audio storage options to the left of the fireplace. Can you spot the Sonos wireless speakers on this bookcase? Today, almost every house function can be operated with a touch of a button - from automated lighting and heating, to multi-room audio & video systems that enable music or movies throughout the whole house. I always counsel clients to install home automation systems that are simple and easy to operate. There is no point in installing lighting controls that you need a manual to operate. I have seen this in homes I have visited and often wonder what it’s like being a guest if you don’t know how to simply turn lights on and off. That being said, there are some amazing technologies that make for easy use and installation. In my case, I recently explored wireless speakers and a new stereo system. The backstory is that when I gutted my house 12 years ago I installed some wired in-ceiling and bookcase speakers and each room had its own control and a master remote. Fast forward to today when I repainted the whole house I looked for some updated solutions since our five CD player was no longer working and I wanted to join with many of my clients and integrate my music IPhone library. Also, I was very interested in listening to radio around the world, especially in Ireland where my family lives. And, lastly, I have become a huge fan of podcasts so this was another element I wanted to integrate into our home audio. With the help from Jeff Gosselin from Cloud9 AV Solutions I now have wireless speakers throughout the house. First I tried the SONOS system and then I test-drove another company; Bluesound, who make a similar product. In the end we selected Bluesound because it was more streamlined looking and we felt that the sound was slightly better. We now control the music in the house through our iPhones and can easily bring speakers inside or outside, listen to radio from around the world, podcasts and endless music streaming. We really appreciate the wonderful sound and the ease of use. As well, we were able to save and recapture space once we got rid of our CDs and our very large stereo components. Bonus! ©2013 Casey Design | Planning Group Inc. All rights reserved.